The Combi systems combine Supply Water and District Heating leakage protection in a single control unit. These may be used in installations where the entry points of water and heating systems are in close proximity. Normally insulated buildings up to app. 250 m² with hot water storage and normal water consumption pattern; supply water connection ½" (CB/B) or ¾" (CX/B). Normally insulated buildings up to app. 250 m² with direct supply water heating, or up to app. 400 m² with hot water storage and normal water consumption pattern; supply water connection ½" (CB/B) or ¾" (CX/B). Forward and Return flows are monitored continuously, compensating for volume and meter differences. If a preset flow difference limit is exceeded, leakage alarm is issued and the installation is cut off. The patented OptiTight® mechanism employs individual control of the cut-off valves to test the installation tightness one or more	times daily, whereby even minute seepage may be detected. The System permits the continuous discharge of a preset amount of water. If this amount is surpassed in a single discharge, a Max Alarm is issued, and the water supply is cut off. The system checks that water flow in the installation can drop and remain below a preset level for a preset time duration, and will issue a seepage alarm and cut off the water supply if this fails to occur daily. The system checks that the supply water flow meter issues impulses regularly, unless the Holiday function is active. The system checks Forward and Return flow meters against each other, whereby meter blocks and occurring defects are immediately discovered. Whenever any valve is closed - manually or by alarm - the system checks its tightness. If a component fails, a System Error is issued, and the relevant installation is cut off. The system monitors the mains supply and all internal supplies. If either of these fail, a Supply Error is issued. This may not cause a cutoff of water supply or heating installation. Mains, Flow, Fwd, Rtn, Valve and State indicators, buzzer. Buttons for manual valve control water/heating, temporary free discharge selector, holiday function and alarm acknowledge water/heating. Base measuring period 210 sec. Truncation at 16/32 litres forward volume (FB/FX). Tolerable flow difference Fwd-Rtn in measuring period 2.5/5 ltr (FB/FX). Activation: 1, 2, 3, or 4 times daily. Base time 02:00 + 24 / 2*12 / 3*8 or 4*6 hours. May be delayed up to 1 hour if consumption is high. Duration: 7.5, 15, 30, or 60 minutes. Sensitivity up to 1 liter/hour. Permissible single discharge selectable 125, 250, 500, or 1000 litres. Flow minimum to terminate discharge 15 l/h. In holiday mode, permissible single discharge is 20 litres regardless of setting. Free discharge duration selectable 1-8 hours. Seepage tolerance 2, 4, or 8 litres in 30 or 60 minutes. Observation interval 24 hours. 230V 50Hz L/N/PE via external key switch. Power consumption max 20VA. On Leakage and System errors, system Combi will cut off the affected installation, issue visible and audible alarms and activate the relevant alarm relay. Supply errors are reported via the alarm relays, and if possible also visibly and audibly. 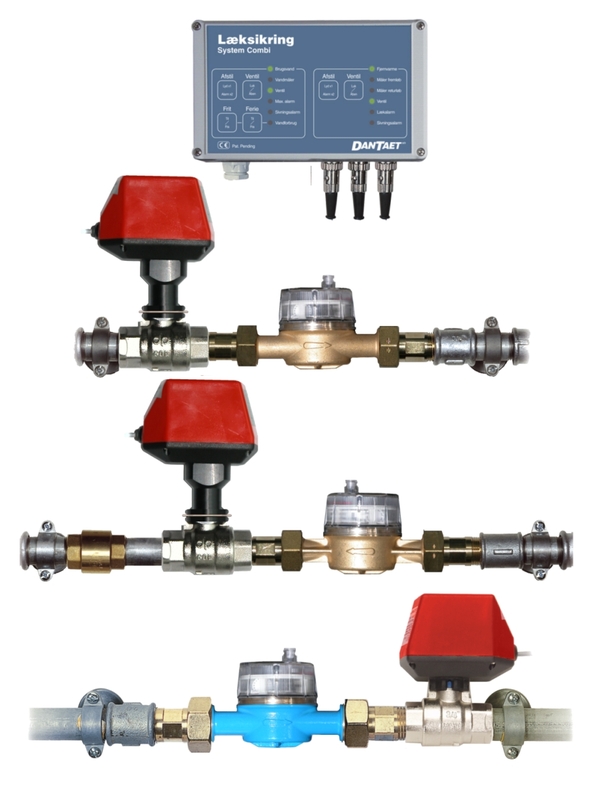 The Combination Systems accommodate via interface ILS-C up to two Liquid Sensors type LS-X, whereby the system offers point protection of particularly sensitive areas so that the water supply or heating installation may be cut off on Liquid Sensor alarm if desired. By attachment of an external SMS-alarm to the alarm relay output, the Combination systems can ship a text message to a selected mobile phone number.